Mediterranean chain Luna Grill will open its fourth Inland Empire location today (March 6) in Rancho Cucamonga. Wok N’ Grill has opened a second location in Redlands. The fast food restaurant specializes in Chinese food and Mediterranean entrées, as well as burgers, sandwiches, hot wings and more. The new location is at 1596 N. Orange St., the latest in a long string of restaurants to occupy the A-frame building. Wok N’ Grill’s original location is at 905 N. Waterman Ave., San Bernardino. For updates, “Like” Wok N’ Grill on Facebook. Allan Borgen and Jeff Williams’ Let’s Dine Out Show has announced the location for its next Grub Club outing. It’s good news for those who are curious to try Persian cuisine. 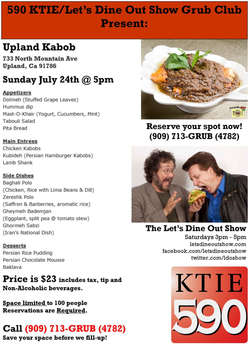 The event will take place at 5 p.m. Sunday, July 24 at Upland Kabob, 733 N. Mountain Ave. in Upland. The dinner costs $23, which includes tax, tip and non-alcoholic beverages. Reservations, which are limited to 100 guests, are required. Items on the evening’s menu include: Dolmeh (stuffed grape leaves), hummus dip, tabbouli salad, chicken kabobs, lamb shank, sereshk polo (saffron and barberries aromatic rice), gormeh sabzi (Iran’s national dish), Persian rice pudding and baklava. 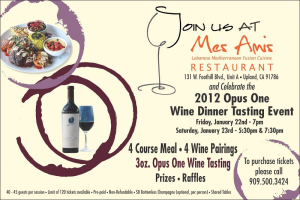 These events typically sell out, so if you want to dine out with the Let’s Dine Out crew, make your reservation ASAP. Call 909-713-GRUB (4782) to reserve your spot. For more information, including a full menu, visit their Facebook event page here. Elaine Lehman stayed close to home base this week and went to Giuseppe’s on Euclid in Upland. Giuseppe’s is unique in that they offer both Italian and Persian cuisines. Elaine went out of her sphere of familiarity and opted for Persian. She ordered the Koobideh kabob special and liked it. So next time you’re in the mood for a little hummus with your ravioli, you know where to go. Click here to read more about Elaine’s experience at Giuseppe’s. Allan Borgen mixes things up this week and discusses the breakfast items available at Buckboard Barbecue and Grill, also in Upland, on Foothill Boulevard. I’ve heard Allan talk about Buckboard before, and if I remember correctly, he’s even broadcast his radio show from there. So it’s no surprise that he enjoyed their breakfast offerings, giving them them four of five stars. If you’re thinking of heading over there to check out their breakfasts for yourself, you might just want to click here first.